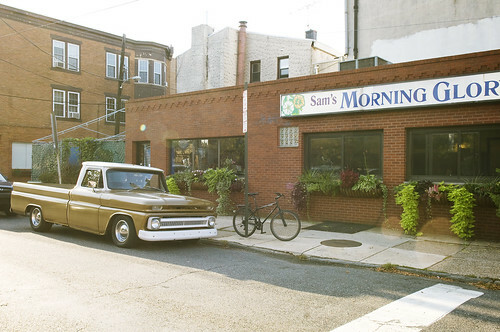 The number of times we drove past this dandy little joint in south Philly without ever even noticing it is certainly innumerable. Well, truth be told, I did notice it every time we made the trek from West Philly to South Philly for cheesesteaks at Pat’s – the dangling flowers on the outside always lead me to believe that it was a flower shop. The association was strange, I know, and fortunately, 9 years later, I stumbled over this glorious little diner at the corner of 10th and Fitz. 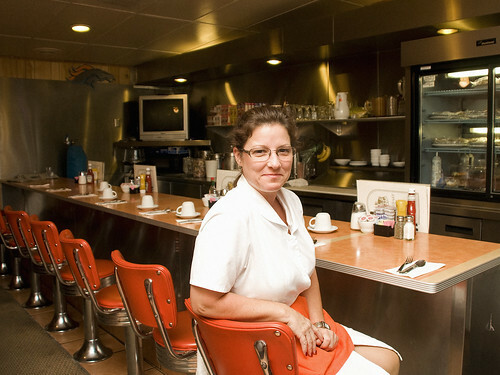 Every diner seems to have its own little quirks that make it charming (or an event to be forgotten) and Morning Glory is no exception. 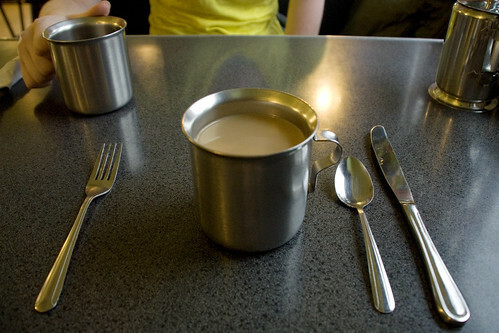 Most noticeable are the stainless-steel coffee cups (that I’ve heard were relics of a by-gone era that the diner scarfed up upon discovering them). And if, by any chance, that story is true, it adds just a bit more to this diner’s lure. Additionally, the ketchup is home-made and served in giant green glass bottles and a variety of condiments abound — my favorite, perhaps, was the Scorned Woman Hot Sauce. I can be sold on anything, as long as it’s easy on my eyes and the very first time I sauntered into Morning Glory on an overcast, late-June day, I knew what I wanted before I was even seated. The grand, green Breakfast Burrito yelped at me from the plate it rested on at the bar as I walked by to my seat in the comfy blue (and rather inviting) dining room. 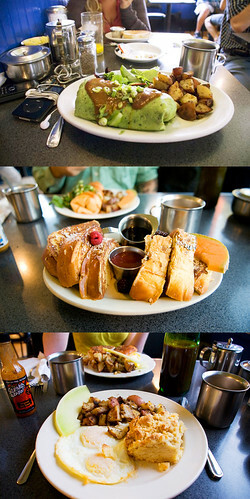 Presentation is key and Morning Glory, perhaps, excels like no other (diner). It’s the little things that count and the small slices of fresh-cut melon (honey dew or cantaloupe) are laid neatly on the side of one’s plate. And let me take one second to gush about the fruit; having grown up in farm country (Lancaster, PA) I am somewhat of a produce snob and the honey dew I had that morning rivaled anything I’d ever find at Central Market in downtown Lancaster, and that, my friends, is an awfully difficult task to accomplish. Typically, I prefer to avoid long lines, so i enter early (7 on weekdays or 8 on the weekends) and in my last visit, the cooks were singing and carousing with the servers and with the regulars (reading their Inquirers or City Papers at the bar). One of the regulars rolled up in a tan Chevy pickup, straight out of the sixties and, for a moment, I lost myself inside this little diner-world, soaking in the timeless ambiance of excellent food and damn-near perfect atmosphere. Morning Glory ain’t no flower shop, as I so wrongly assumed my sophomore year of college, and that’s a glorious thing. You’d be best to visit (and make yourself a regular relatively soon).